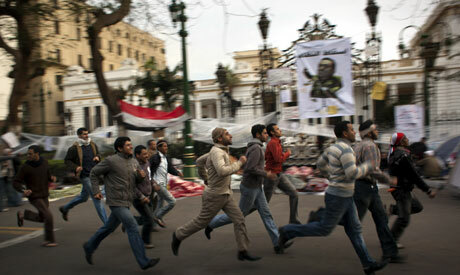 Demonstrators run before parliament building, Thursday morning (AP Photo/Emilio Morenatti). “The Youth Revolution” has become the term widely used to describe Egypt's recent uprising, despite the diversity of its members. Although people of all ages and various social backgrounds have taken part in one way or another in the (thus far) 15-day revolt, the uprising has been widely attributed to the youth primarily because of their 25 January Internet initiative. The Khaled Saeed Facebook group, which was formed to commemorate 28-year-old who died at the hands of Egyptian police, had taken the initiative to declare 25 January a day of Egyptian revolt to condemn police brutality. Following their steps, several bloggers, Facebook and Twitter users, as well as activist groups and associations, quickly adopted their call. Although few believed it could actually happen, the initiative snowballed to become Egypt's largest uprising in its modern history. Hoping to create a form of representation for themselves, many young activists have banded to form a coalition called “The Revolution's Youth”. Groups involved include the 6 April Youth movement, Justice and Freedom, Muslim Brotherhood youth, ElBaradei's campaign, The Popular Democratic Movement for Change (HASHD), The Democratic Front and Khaled Saeed Facebook group administrators. The coalition has 14 group representatives in total and a general assembly with a few hundred members. The group representatives include Ahmed Maher and Mahmoud Samy from the 6 April Youth movement, ElBaradei supporters Ziad Alimy and Abdel Rahman Samir, Islam Lotfy and Mohamed Abbas from the Muslim Brotherhood, Shady Ghazali Harb and Amr Salah from the Democratic Front Party and from the Youth for Justice and Freedom, Khaled Sayed and Mostafa Shaki. Additionally, Wael Ghoneim, one of the founders of the Facebook group “Kolona Khaled Said” (We are all Khaled Said), as well as independent activitsts Naser Abdel Hamid, Abdel Rahman Faris and Sally Moore are also members. According to Ahmed Ezzat, a HASHD and coalition member, the coalition is still expanding and intends to include other young and diverse political trends that have been part of Egypt's political sphere over the past few past years. "Although it started with only these groups we hope it expands to include all the other young activists, including young members from the Karama party, Labor party, Kifaya and all others including independent bloggers and Internet activists,” says Ezzat. Not claiming that they are talking on the uprising's behalf, the coalition was formed with an aim to provide representation for the young who have played a role in political life in Egypt and have contributed to the current revolt. However, the uprising has taken its own path, independent of these groups, and, according to many of their members, the coalition only aims to articulate its demands and keep them at the forefront of public consciousness as Egypt prepares for change. Although diverse in vision, the coalition's groups have long agreed on basic demands, which they believe will lead to a more democratic Egypt, and have worked cooperatively in recent years to push for these common goals. The groups' common requests have included an end to police brutality, the abolition of emergency law, free and fair elections, constitutional changes and an end to Mubarak's thirty-year rule. The coalition’s current stand is not to engage in any negotiations until pesident Mubarak steps down. While many coalitions claiming to represent the revolt have already involved themselves in such talks with government bodies, the coalition of the Revolution's Youth has insisted on its primary demand before any details are discussed. In Tahrir square, where tens of thousands are still holding daily protests, the coalition has set up its own stage in front of the Mogama'a building, with speakers and microphones, through which it transmits its views and latest developments to the public. The stage is also used for young people to perform their music and poetry. The coalition’s main challenge now is to sustain an organized body in which the thousands of young Egyptians that are now taking to the streets can be represented. 8. The army should push for the democracy movement and urgently end the stand of with Mubarek. 9. All the officials should be banned from leaving the country and the attorney should immediately do that. Including Mubarek. 10. The youth will nominate through its members the caretaker committee in consultation with Muslim Brother hood and other big players. 11. International bodies should stand with the revolution so it can be a speedy transition. It is also necessary to stop the economy from backsliding. The international embassies should stop supporting MUbarek and openly demand him to step down. I am from East Africa and I hope this will be a new day for AFrica. Want to help egypt people ? It's easy : vote in one click on www.worldemocracy.com, tell 10 friends to do so, share it massively on facebook / twitter. Thanks for them. Worldemocracy, it's every day one opportunity to express your vote on a subject that affects you. Warmest congratulations for your excellent and inspiring news coverage. Our hearts are with you.